Need a kobold name fast, or just looking for inspiration? Download the Kobold Name Generator by Seth Hopkinson! The too-talls shake their hairy heads at the bizarre array of names that kobolds call themselves. Kobolds see this as an opportunity to trick and confuse their rivals, of course. Most kobolds share only their sobriquet with other races and are not afraid to make up a new one on the fly if necessary. This does not help them with their own kind, who give honest, but sometimes cruel, sobriquets to their fellow kobolds. 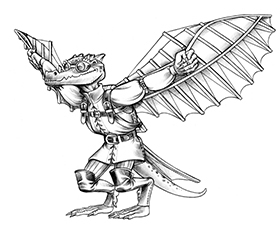 A sobriquet can define a kobold: Guttersneak is shifty, Goldscale is noble. This can also work in reverse: Guttersneak earned her name on many a dark night in Zobeck. Sobriquet traits allow you to add game effects to these names and make them real to your kobold character. A kobold lives with its sobriquet as it does with its skin. 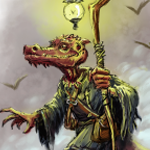 The sobriquet follows them throughout their daily life, coloring all of their interactions with their fellow kobolds for good or ill. A kobold can try to change a negative sobriquet such as Damnfool or Trapcaught, but it is likely that the event that gave him or her the name will still be told. A kobold looking to redeem herself must literally make herself a new name: by actions, not words! A shameful event from your puphood follows you to this day as an embarrassing sobriquet. Prerequisite You are a kobold and must have an embarrassing or otherwise negative kobold sobriquet like Wrongsneeze, Damnfool, Trapcaught, Manslave, Lumpback, or so on. Benefit You are touchy about your honor, and you gain a +1 bonus to attack rolls and to damage rolls against any opponent who has previously mocked you. Goal You must either defeat single-handed an opponent of your CR+1 in a way local kobolds will be unable to miss, or you must steal/con out of an enemy of the local kobolds money or items worth at least your level x 5,000 gp. Completion Benefit You may choose a new sobriquet and sobriquet trait, preferably one that celebrates your victory. You are considered a noble among kobolds and gain a +2 bonus to your base Leadership score if you have the Leadership feat. Your legendary status gives you a +2 bonus to Diplomacy, Bluff and Sense Motive checks among kobolds. You save 10 percent when buying and selling items to kobolds. Suggested Traits Crooktail, Lumpback, Reactionary, Bullied. Benefit: You gain 2 extra bravado points, and your maximum bravado increases by 2. Special: If you possess levels in the kobold bravo rogue archetype, you can take this feat multiple times. Deepeye (Gemsight, Blackeye, Nightlove): Your darkvision is supernaturally keen. It increases to 70 feet if you possess darkvision. Ratcooker (Bonesaw, Hutcobble, Grindgem): You have a natural aptitude at one craft (other than traps) or profession. You gain a +2 bonus to that skill and it is considered a class skill for you. Tomeclutcher (Booklover, Scrapscribe, Strangeknower): Instead of mucking about with traps, you spent your puphood sneaking in libraries and stealing books from the too-talls. You may replace Craft (traps) with one Knowledge skill of your choice, and that skill is a class skill for you. Manslave (Elfshackle, Ghoulslave, Dwarfthrall): You have spent hard years as a thrall or slave to members of another race. Many painful lessons have taught you how to cower and lie, and you judge members of that hated race harshly. You gain a +1 to AC against attack from this one race, and a +2 bonus to Bluff and Sense Motive checks against members of that race only. 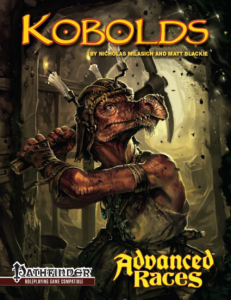 If you pick up a copy of Advanced Races: Kobolds, you can add more kobold options to your game! I gotta say, I really love that cover! The “Bad Name” is delightful, lots of good roleplaying hooks there. I would take it for a kobold without a doubt. This is great. Names are often the hardest part of NPC’s and sometimes PC’s and there are really fun ideas here to make names meaningful.